Well, my first Zentangle® class went well. There were seven students and it was great fun to see how they embraced the method. Like student Marilyn said, they all received the same instructions yet each tile is unique to the artist. I’ve scheduled two more classes for next week. First a shout out and thank you for my friend Laura who put the word out to her large mailing list and to our local newspaper – The Clearwater Tribune. Due to the success of the first Zentangle® drawing class offered, artist Susan White, a Certified Zentangle Teacher (CZT), has scheduled two additional classes in November. Zentangle is a fun and easy to learn method for creating beautiful images by drawing structured patterns. It can be a technique for promoting a relaxed and focused state of mind whenever or wherever it is needed. Susan is one of only three CZTs in Idaho. Two questions are commonly asked about the Zentangle method. The first is often “Isn’t that just doodling?” Susan explains that “doodling” is one of many approaches to drawing, the Zentangle method increases focus and creativity, provides artistic satisfaction along with an increased sense of personal well being. 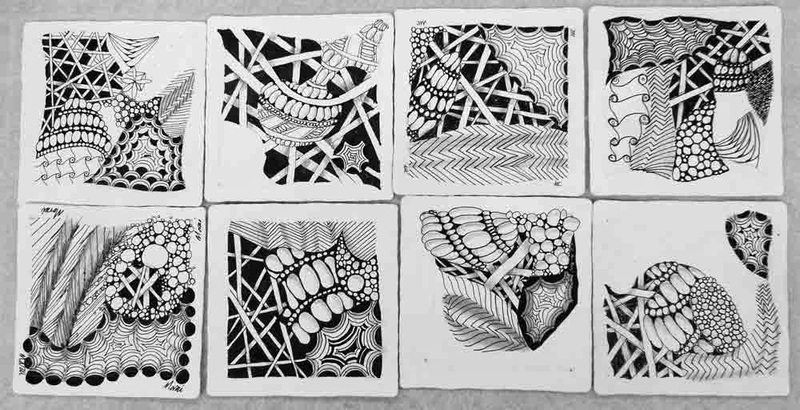 Artwork completed through the Zentangle approach is often revered and shared while doodles are often lost or discarded. For certain, there is no shortage of opinion on the answer to this question. Introduction to Zentangle Part 1 class will be offered Tuesday, November 19 at The Wild Hare from 1:30-3:30 pm. Students will be introduced to the Zentangle drawing method and the steps for creating original Zentangle artworks at 3.5” by 3.5”. No artistic experience is necessary. Each student will produce unique artworks that develop as each new stroke is added. Introduction to Zentangle Part 2 class will be held Tuesday, November 19 at the Wild Hare from 6:00-8:00 pm. Students will learn additional tangles and techniques for creating their artworks and should bring supplies from the first class with them. The recommended age for attendees at these two classes is teen through adult. The number of students will be limited to 12. Supplies are included in the class fee. Students are provided with clear, simple instruction in a safe, judgement free environment. Pre-registration is required for all classes. Please contact Susan for more information, to inquire about arranging classes in other settings, or to arrange for private lessons. Stop in at the The Wild Hare downtown Orofino to pre-register. I confess that I’ve always been a bit sceptical about Zentangles but your students’ work is fabulous. I think it would translate beautifully into free machine embroidery. I was a little skeptical also but since attending the certification class and doing more drawing and teaching, I have a new appreciation for taking a class from certified teachers. After taking the training, it is easy for me to tell who has been taught by a CZT and who has not. I also can feel the difference between being in a drawing/doodling mode and drawing/zentangling mode in my own work.